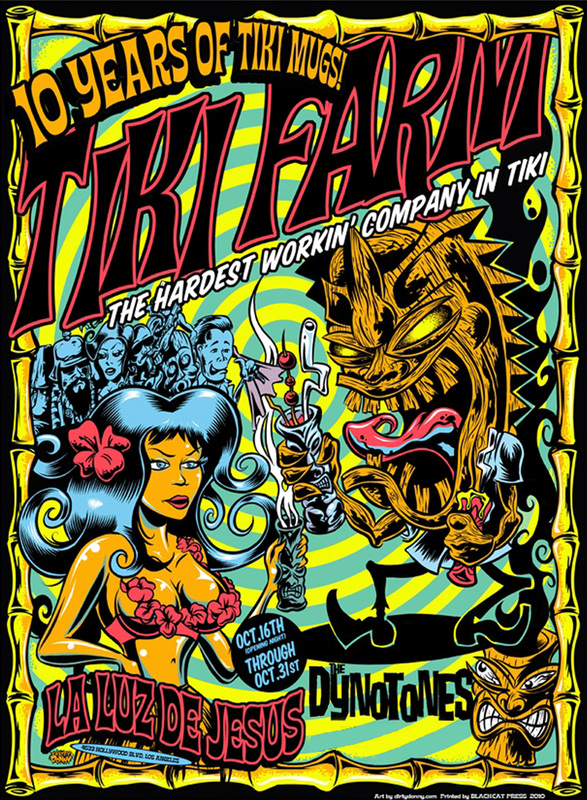 Until October 31st, the exhibit 10 Years of Tiki Farm will be on display at La Luz de Jesus gallery on Hollywood Boulevard (across from Bar Covell). 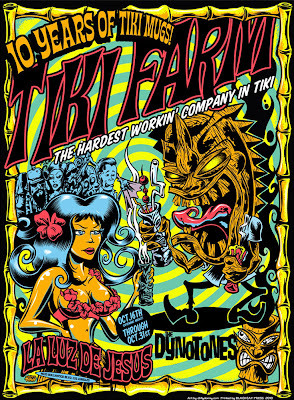 Tiki Farm is the foremost producer of tiki mugs and this exhibit covers their Catalogue Raisonné, including rare and infrequently seen items. The photograph above shows the gallery thronged by fans. 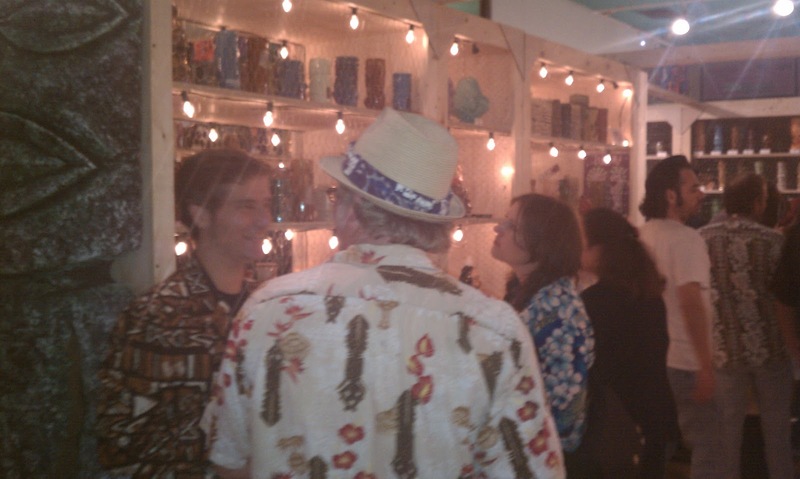 A party to celebrate the opening of the show was held last weekend and it was mobbed by Tiki fanatics all eager to get a look at the mugs, buy one of the limited edition items, enjoy the sounds of the live tiki band and sample the free mai tais. The party was a huge success; the rain did not appear to have dampened attendance. The line to purchase items was over 20 patrons deep and the corridors of the exhibit were crowded with excited aficionados, many of whom were wearing Hawaiian shirts and other regalia of their tribe. 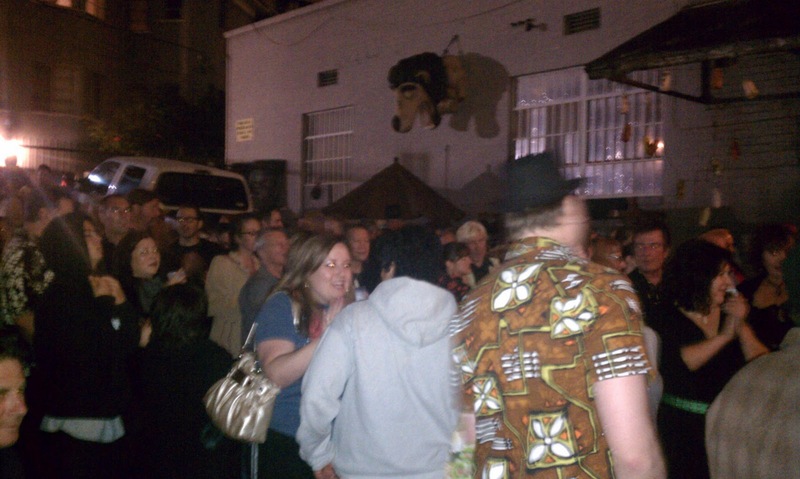 The parking lot was turned into a little oasis of the South Pacific and many attendees danced to the beat of the band. The outdoor scene is pictured in the photograph above. You only have 10 days to get there and see it before the exhibit disappears, perhaps into the Bermuda Triangle. So hurry! Hawaiian shirts optional.